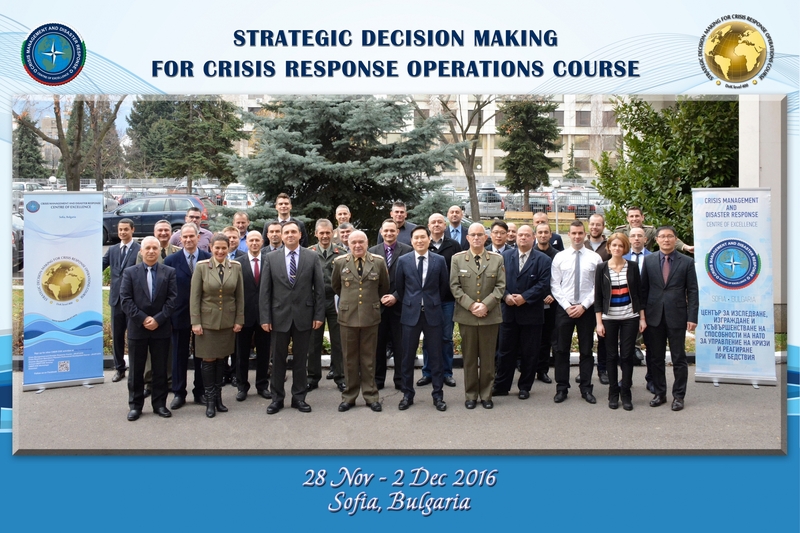 The course aimed at providing extensive knowledge related to NATO Crisis Management and the Alliance contribution to a Comprehensive Approach. The event gathered a diverse group of subject matter experts including NATO AIRCOM HQ, Multinational Joint Headquarters Ulm, NATO Force Integration Unit Bulgaria, Ministry of National Defense of the Republic of Korea, Romanian Home Office, Bulgarian Ministry of Defence, National Military University, Joint Forces Command, Navy, and from the Rakovski Defence College. The course objectives were achieved as a result of the wide range of topics covered and complemented by creative and productive teamworks, thus impelling great interest in the attendees. The CMDR COE would like to express sincere gratitude to the guest-lecturers from NATO HQ, Bulgarian Delegation to NATO, SHAPE J5, ‘Vasil Levski’ National Military University, Bulgarian Nuclear Regulatory Agency and Bulgarian Red Cross.